A grim future looms over Varanasi’s bunkars, the craftsmen of the glorious Banarasi sari. Warp and Weft: A still from the film. In a dingy room in Varanasi’s Peeli Kothi, 27-year-old Niyaaz is at work on a loom. Every 10 minutes, he uses a broken mirror to see the reverse of the silk brocade he is weaving, to check if the pattern is free of errors. The deep purple piece of Banarasi silk is not a sari, but meant for use in a Tibetan monastery in Indonesia. Niyaaz works with three other weavers in the room, all his cousins. Their family has been weaving for generations, but only these four now work on the handloom. Others have shifted to powerloom, which is currently riding the wave of mass commercial demand. Niyaaz would love to “live and die a Banarasi sari bunkar (weaver)” but it’s a difficult ask. “The sari market is flooded with powerloom products. We survive on orders from Buddhist monasteries,” he says. Peeli Kothi is a 200-year-old weaver colony that has inspired many contemporary designers. Sabyasachi named his 2011 couture collection after it; designers such as Rajesh Pratap Singh and Manish Malhotra are known to collaborate with its masterweavers. But a few hours spent here reveal the precarious lives of its bunkars. 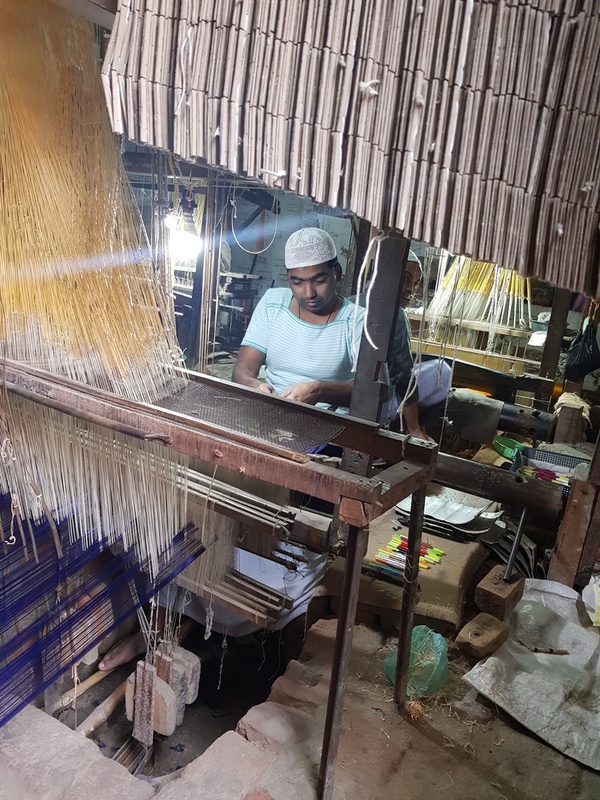 Sitting in his shop, surrounded by stacks of handwoven Banarasis, masterweaver Haseen Mohammad, in his 50s, warns that the glorious tradition might not survive for too long. “In the last decade, only 25 per cent looms have remained, with most weavers taking to the powerloom, which is easy work and can even run on auto-mode all night. There are 1.5 lakh powerloom workers, as against 30,000 bunkars. This skill will die out in just 50 more years,” says Mohammad, a fourth-generation artisan who specialises in Banarasi fabric and saris. He says actors Anushka Sharma and Kangana Ranaut have worn saris woven by him, including the red Banarasi that Sharma wore on her wedding reception. In Madanpura, another weaver colony, the doors of most houses are shut. Every shop here claims they sell the “real” stuff even though the price of a sari is between Rs 2,000 and Rs 10,000. A Banarasi sari takes three months of labour on handloom to create — thus, the labour cost is itself Rs 18,000 and upwards. The sari starts at Rs 25,000, and may go up to Rs 1 lakh or more if a designer has created the sari. The sound of machines fills the narrow bylanes, but no one admits to using them. An estimated 1,000 powerlooms operate in Madanpura. There is no sign of a bunkar here. Powerloom workers get Rs 150-200 a day, but all they have to do is set the pattern, let the machine work on auto mode while they watch TV or do other work. Elsewhere in the city, too, everyone is selling the “handloom” Banarasi but no one has a way to verify the claims. Bharat Shah, chairperson of SND Enterprises, one of the biggest textile establishments in the city, puts it in perspective. “Anushka Sharma wore a red sari for her wedding function, which was handcrafted for her in Banaras. As many as 7,000 similar pieces were sold here in the next two months, ranging from Rs 1,000 to Rs 2 lakh,” says Shah, who employs 8,000 weavers and creates saris for the collections of designers Sabyasachi, Abraham & Thakore and Manish Malhotra. 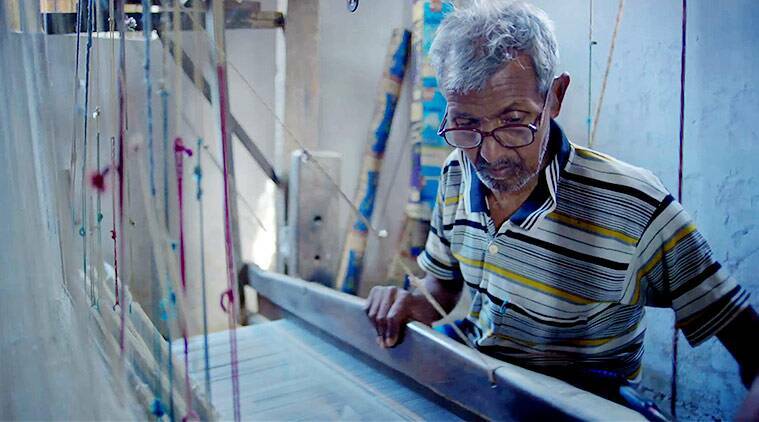 A short documentary, Bunkar – The Last of the Varanasi Weavers, which released late last year at IFFI, Goa, shows the plight of the struggling weaver and the slow perishing of one of India’s finest skills. Says director Satyaprakash Upadhyay: “The powerloom has distorted the market. However, the quality of the handloom fabric is unmatched and as a weaver explains in the film, the touch of a true Banarasi sari on your arm will give you goosebumps,” he adds. In the film, weaver Ramlal Maurya says, “Only the 10 per cent affluent families in India now patronise us.” Another weaver, who remains anonymous, says, “The government should fix a daily remuneration for us. We don’t even get more than Rs 250 a day. A construction worker earns Rs 500 a day.” But more than his financial want, the marginalisation of the bunkar may sound his death knell. “We once prided ourselves on doing the king of all work. That our talent is being undermined is the most painful aspect,” adds the weaver. In 2009, the Banarasi sari got the GI tag. “According to the GI mandate, only the fabric made in the five districts (Varanasi, Chandauli, Bhadohi, Mirzapur and Azamgarh), by hand, using the traditional method, will be considered Banarasi. Everything else is counterfeit,” says Rajini Kant, general secretary of Human Welfare Association, an NGO that works for bunkars in the area and that effectively lobbied for the GI tag . But that has not helped stem the deluge of powerloom saris. “In these five districts, there are more than 2 lakh powerlooms, rendering 5 lakh bunkars jobless,” he says. The worst period for the bunkar began in 2008 — it was only in 2011 that the demand started picking up. “Dalit weavers were the worst affected because they didn’t have land to fall back on. Many of them shifted to unskilled labour jobs, some even digging wells under MGNREGA,” says Kant.